"Recent events in Charlottesville and Durham challenge justice-minded North Carolinians to remember that the fight against hate requires a coat of many colors. Some photos in the African American Registry stand out. 1, 2, 3. Such accounts highlight activities such as Tourgée’s substantive role in the founding of Bennett College. Works dedicating particular attention to his legal career bear the title “Color-Blind Justice,” reflecting his role representing Homer Plessy in the 1896 separate-but-equal Supreme Court case of Plessy v. Ferguson. Though he lost the case at the time, his work was substantially the foundation when Brown v. Board of Education overturned Plessy 60 years later. 4,5,6. 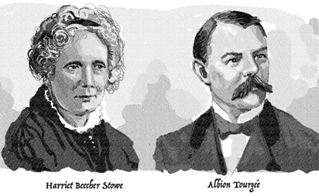 When anti-slavery chronicles focus on reconstruction, one will often find Tourgée chronicled alongside key figures such as Harriet Beecher Stowe. The association is particularly apt given Tourgée’s post-judicial career as a best-selling author chronicling reconstruction and the post-war plight of African American Southerners. 7. A year later, Tourgée published “Bricks Without Straw,” presenting Reconstruction through the eyes of emancipated slaves, making it unique among the white-authored works of its time and evidencing the remarkable relationship Tourgée had built with North Carolina African Americans. Tourgée’s writings evidence a remarkable commitment and ability to analyze and articulate counterpoint, presenting compelling descriptions of why the KKK’s development was a natural product of the culture, and offering contrasting descriptions like “The Northern Idea of the Southern Idea of Slavery” and “The Southern Idea of the Northern Idea of Slavery.” 8,9,10. Subsequent entries in this series will highlight key experiences Tourgée shares, providing guidance to Greensboro, North Carolina, and US Citizens who wish to respond to current events with an undaunting commitment to equality and justice." 4.Kevin Reid, Images of America: Greensboro, Arcadia 2014, p. 83. 9.Fool’s Errand, Waveland Press Edition, Chapter 39. 10.Fool’s Errand, Waveland Press Edition, 138-139.